We are extremely proud to introduce Flag, pictured above at 13 months showing she has matured into a special lady. 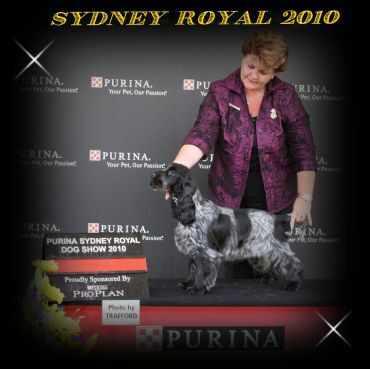 Flag now has enough points to be known as an Australian Champion, she is my 11th homebred Champion and the 3rd for 2010. She is an attractive blue girl of correct size and substance with beautiful bone, lovely spring of rib and an attitude like nothing else. Flag has been tested CLEAR PRCD and CLEAR FN by Parentage. "Blue roan. A size more all over. Balanced head. Good head carriage, neck and forehand. Sturdy legs, body and ribs. Strong hindquarters. Scored in substance." 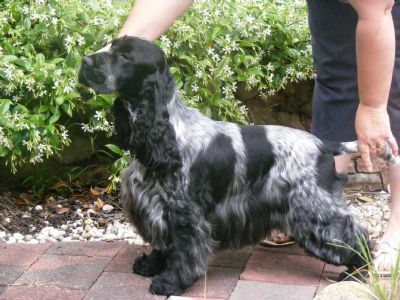 Flag has just attended her 1st Contest of Cockers hosted by The Cocker Spaniel Society on NSW Inc. And she finished 3rd overall against some very strong competition. Judges were Mrs Julie Gotch (Clarvale), Mrs Ruth Fazey (Wintergem) and Mr Norm Strathdee (Padtheway) - We are so proud !! !